The opening hymn is Hymn No. 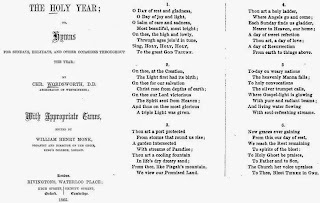 470, “O Day of Radiant Gladness” that was authored by Christopher Wordsworth (stanzas 1 and 2, 1862), Charles F. Price (stanza 3, 1980), and an anonymous author (stanza 4, 1982). The tune is the same tune we sang on July 20 and on August 31, 2014, ES FLOG EIN KLEINS WALDVÖGELEIN when we sang Rusty Edwards’s hymn, “We All Are One in Mission.” The tune dates from the 17th century, and was harmonized by George Ratcliffe Woodward in 1904. In the book (above) in which the words were originally published, the word is “rest” not “radiant,” so that must be the correct wording. I don’t know who changed it. Maybe they changed it because, other than sleeping late, no one rests on the Sabbath anymore. We also don’t get to sing Wordsworth’s stanzas 3 through 6. The author of the third stanza is instead Charles P. Price (b. Pittsburgh, 1920, d. 1999). 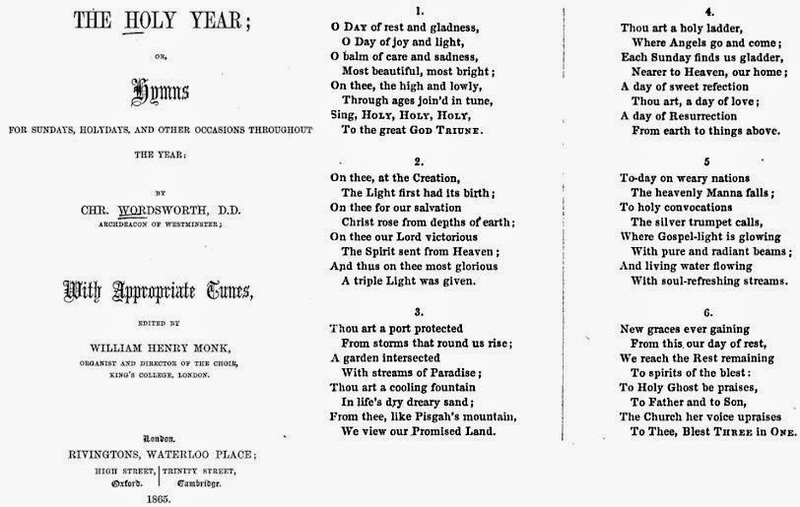 He served on the Committee on Texts for the Episcopal Hymnal of 1982, so, after the second stanza, Wordsworth’s original stanzas have been dropped and Rev. Price’s verse substituted instead. Serving on a denomination’s hymnal committee seems to be a very effective way of getting one’s own poetry published as the text to a hymn, as I’ve noted for two other authors of hymns we’ve sung. Charles Price attended Harvard, the Virginia Theological Seminary, and Union Theological Seminary in the City of New York. He served as Professor of Christian Morals at Harvard University (1963-1972). In 1972, he gave up that job and returned to teaching at Virginia Theological Seminary where he had previously taught from 1956-1963. There he was Professor of Systematic Theology until 1989. The second hymn is Hymn No. 347, “Forgive Our Sins as We Forgive” by Rosamond E. Herklots. Rosamond Herlots was British and was born in North India. She graduated from Leeds University, and worked as secretary to a neurologist then in the offices of the Association for Spina Bifida and Hydrocephalus in London. The tune is DETROIT is attributed to “Bradshaw.” It appears in sacred harp hymnals, the Supplement to the Kentucky Harmony, 1820, and The Southern Harmony and Musical Companion (Baptist Harmony), 1854.
http://www.sacredharpbremen.org/lieder/026-bis-099/039t-detroit DETROIT, click on the play icon for Vierstimmig. http://youtu.be/etmWYmh5Plk DETROIT, sung by Tim Eriksen and friends in Jaroslaw, a town in south-eastern Poland with about 40,167 inhabitants. The closing hymn is Hymn No. 358, Fred Kaan’s “Help Us Accept Each Other.” We sang this as the second hymn on July 20, 2014. We also sang it on More Light Sunday (June 1, 2014). The words are most frequently sung to the tune ACCEPTANCE by John Ness Beck, but that isn’t the tune used in the Presbyterian Hymnal. We heard this prelude at the service of May 4, 2014. John Redford was the organist at St. Paul’s Cathedral and choirmaster there from 1531 until his death. I wonder if the lashes actually improved their singing. I suppose it might have been an encouragement for memorization of the words. Sandy may want to test it out with our choir. Dunstable was born about 1390 and died on Christmas Eve day, 1453. Dunstable is believed to have probably been born in - - - - Dunstable! No one knows when he was born, but as some of his music which has survived was written sometime between 1410 and 1420, the guess is around 1390. He served John of Lancaster, 1st Duke of Bedford, the fourth son of King Henry IV (and, of course, a brother of Henry V). After serving the Duke of Bedford, he served Humphrey, Duke of Gloucester, the fifth son of Henry IV. John Dunstable, in addition to being a composer, was an astrologer, astronomer, and mathematician.